This section is primarily for scientists and other researchers who want to find more detailed information about the Athabasca River Basin. Please check out the resources indicated to the left. 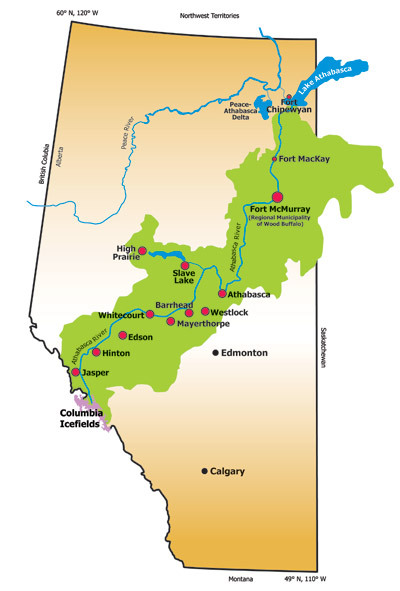 The Athabasca River Basin extends from its headwaters at the Athabasca Glacier near Jasper, northeast through the province, including the urban centres of Jasper, Hinton, Edson, Whitecourt, Mayerthorpe, Barrhead, Athabasca and Fort McMurray to Lake Athabasca. The Athabasca River Basin has at least 100 tributaries including the McLeod, Pembina, Lesser Slave and Clearwater Rivers. The Athabasca River is the second largest river in Alberta. It has a length of 1,400 kilometres and a drainage area of 138,412 square kilometers. The human population in the Athabasca River Basin is about 150,000. By increasing awareness of the Athabasca River Basin we wish to promote the unique science laboratory that lies on the doorstep of Athabasca, Alberta.